The elongated session of significant snowfall in the northern areas especially at elevated altitude areas of the district Chitral has enforced the Astore Markhors of the Chitral Gol National Park to move to steeper elevations in search of grazeable flora. This continuous cold and snow in the last three weeks has caused the wildlife to move on the territory forming the buffer zone of the Chitral Gol National Park. In the past couple of years, Markhor status in Pakistan has improved from Endangered (EN) to near threatened (NT). A good number of these Markhors moving to steeper altitudes is a solid evidence of increase in their population. This is remarkable and the efforts of the villagers around the national park who organized village conservation committees are harvesting in the form of Markhor revival. Note that Chitral Gol has the highest population of Markhor than anywhere else in the world (Astore Markhor). The villagers consider this a real treat in the winters as they had not witnessed this number of animals in the past few years. 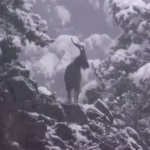 As these wild goats move to lesser elevations, their predator follows and howling of wolves is also being clearly heard all over the hours of darkness for the past few days. The elusive snow leopard which is NOT a permanent inhabitant of the park might also be moving down as their main prey moves. This park is also home to other wild goat species like the large and heavily built Siberian Ibex and Ladakhian Urial.